Le Chameau Unisex Country Vibram Cotton Lined Wellington. After 8 months of very little wear the lining around the heal has disintegrated causing them now to rub my heals. They were replaced by Uttings under the terms of the guarantee but Le Chameau do not renew the guarantee. Therefore I cant see why the same problem wont happen again with this new replacement pair and when it does they wont be covered. These look identical to two previous pairs I have bought but unfortunately I dont think the quality is as good. Perfect condition good quality comfortable boots love them ! 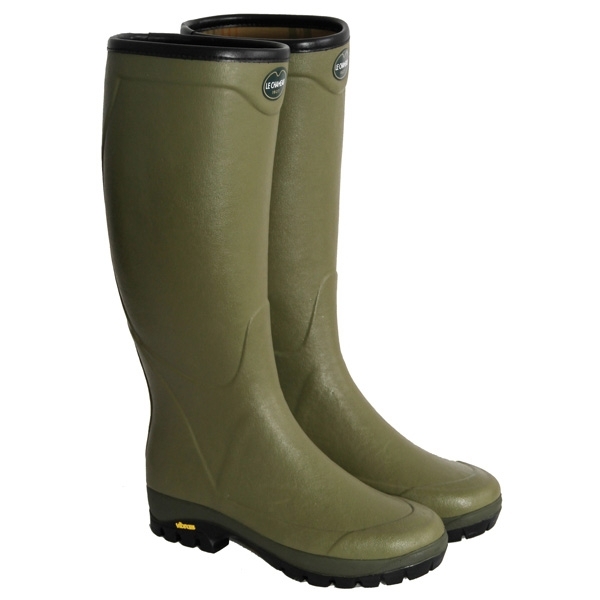 Great wellingtons that last and are comfortable and a great fit not baggy around the calf like some. Ordered Le Chameau boots and received them within 2 days with free boot bag. Excellent service. Very Comfortable but not very durable.&nbsp;These boots fit very well and meet my requirements but unfortunately this is the second pair of Le Chameau boots that have not made it past their warranty period. Last week I discovered a small hole where the heel meets the midsole. Also, the lining isn't as hard wearing as previous pairs.&nbsp;This is disappointing considering the price and even more so when any replacement boots are only covered for the length of the guarantee on the original pair.